An Argentine would not use the word "cojones" spontaneously. I would say "eggs." Instead, it was the term chosen by Santiago Hernán Solari (Rosario, 1976) to open fire as coach of Real Madrid, when referring to the way in which his team should play in Melilla. The expression caused surprise in his own environment, before which the technician admitted that it was a way of adapting to the landscape , the football that structures his life, for his upbringing and profession, but not always his thoughts, nor his forms. Reading, independent cinema, classical music or even 'trip hop', theater and painting are part of the other life that Solari protects with the same secrecy that custody his family. It is the wall after the smile. Son and nephew of former players, he received a strict education from his father , similar to the one that tries to transfer his three children. Not a single public image exists of them or of his wife, Celina Spirandelli . The cordiality is not antonym of the seriousness, and that is something that have been able to verify those who have shared clothes with Solari, outside like soccer player or like trainer. Vicente del Bosque , who directed him at Madrid, remembers him as someone optimistic and disciplined, and especially competitive: "Behind that smile there was a hard guy with a strong leg, very Argentine". «When he arrived, we thought of him as an alternative for a short time, to give relief to Roberto Carlos on the left. But he changed that impression with his work and ended up playing the Glasgow final in midfield, "adds the Salamanca. The Champions returns, this Wednesday in Amsterdam, as a rising coach. He had arrived at the Bernabéu recommended by Pirri , who fished in the liquidation of Atlético, where he played a season, after the relegation. 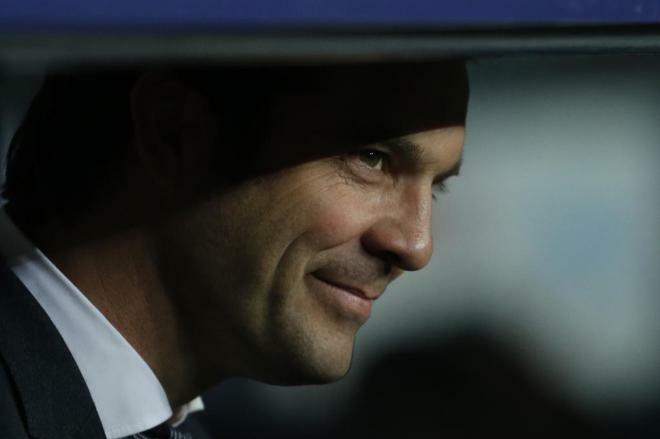 The operation was express and Lorenzo Sanz signed the Solari contract minutes before announcing the announcement of the elections he would lose , despite having won two Champions, against Florentino Perez . The player was part of the inheritance received by the new agent in the dressing room, where his greatest affinity was with César, Helguera or Celades . In some areas of the club they described them with distrust as "the clothing unionists" . Jorge Valdano , then sports director, offered him several times to leave Madrid for the interest of other teams, where he would find more minutes, but Solari always resisted. He spent five years in the club. By then he had already chosen Madrid as the city of his life . Unlike most players, he decided to live in the center so he could go to read the Retiro and often get lost in the Prado rooms. Italy (Inter), Argentina (San Lorenzo), Mexico (Atlante) and Uruguay (Peñarol) were his next destinations. Three years after his retirement he returned to Madrid, a desire also from his wife, to integrate into the lower categories. He made champion cadet B, cadet A and youth B before taking the position of Zidane in Castilla , when the French succeeded Rafa Benitez. Solari had maintained relations with the media as a collaborator, but when he began his career as a coach, he provoked a media blackout. No profiles on networks and whatsApp on hold . In this second stage, already with family, decided to settle in La Moraleja , where he had acquired a plot with a conventional home that later expanded. Austere, he is not fond of luxuries, nor of cars, nor of expensive clothes . The vehicle and club costumes may be sufficient. The rest of the time, 'casual'. Nor is he a friend of big investments or economic adventures. He bought a house in Ibiza , where he used to take refuge in winter, unlike most. With 'Zizou' he had also maintained a good connection in the stage that they shared dressing room in Madrid. However, this could deteriorate, according to some sources, as a result of the management that Solari made with Enzo Zidane in Castilla , an extreme that others deny. The reality is that the player ended up on loan at the Alavés. Enzo was the name of Francesoli, idol of 'Zizou' and also of Solari , since he played in Olympique de Marseille, the city where the Frenchman was raised, and River, club in which the Argentine played before arriving in Spain. In the white subsidiary, Solari found Santiago Sánchez as second. It was the coach who had put the title of coach so that Zidane could direct Castilla. Formed in Canillas, Sánchez is a highly respected coach in Madrid, a man of the house. The club would have welcomed the fact that Zidane had taken him to the first team, but the Frenchman brought in David Bettoni. When offering the position to Solari, there were no doubts. The Argentine also recovered Antonio Pintus and Javi Mallo for the physical field, although this is increasingly done individually, with personal trainers of the players who coordinate their work with the team. The state of Benzema's form is one of the fruits. Roberto Vázquez completes the 'staff' as a goalkeeping coach. With Sanchez could have Isco a snub that would have deteriorated the relationship of Malaga with Solari and caused the hardest of his pulses as a coach . It was the challenge of an interim in front of one of the great assets of the staff, the first gesture that set the principle of authority. Cordial and with evident communication capacity, Solari, however, marks the distances with the players and relies on the captains, with whom he has managed to find agreements . Marcelo is one of them, along with Sergio Ramos and Modric. The substitution of the Brazilian, as a consequence of his form, has been assumed and understood by the heavyweights. Solari has referred on more than one occasion to Del Bosque to praise his management of the costumes, the control of the egos in the Madrid of which he was a part. The Salamanca says that the perfect press conference would be one that, once concluded, no one could distinguish if his team had lost or won. Solari tries that his tone never changes before the means, always with the same smile. "Santiago is kind, it is not easy, but not difficult," says his uncle, Jorge Indio Solari, about his character, reserved in many ways, a characteristic of the people of Rosario. Messi is another example. From his uncle he inherited the nickname as footballer, the ' Indiecito ', a tradition in Argentina. Jorge directed to Tenerife and incorporated Fernando Redondo, who would become his son-in-law and, therefore, the political cousin of the Madrid coach. At present, however, their relationship is distant. His family's ties to football do not stop there. The brother of Jorge and father of the player, Eduardo, was international with the albiceleste, besides playing in Central Rosario and spend part of his career in Colombia, as a footballer and later as a coach. The diaspora has been a sign in this soccer family. Esteban , one of his brothers, played in Spain and Cyprus, and is currently a technical assistant in the Argentina U-20 team. David , the other male, spent time in Israel, where he was a league champion and even approached Judaism. Liz is the only sister, whose life has nothing to do with the ball. She is a popular model and actress. The roots in the soccer of his country have not prevented this iconoclastic Argentine, who does not drink mate , get away to explore other paths and cultivate friendships other than the ball that do not betray his secrecy. The only question is whether the current position will allow him to live his two lives.